The past 25 years have seen more than 30 new or emerging infections identified around the world, including SARS, MERS, swine flu, hepatitis E and new variant CJD, with 75% of these infections considered to be zoonoses. Zoonoses are infections spread between animals and humans. So people that have close and frequent exposure to animals, especially sick animals, or animal products may be at greatest risk of being exposed to zoonotic infections. In 2011, a new virus, Schmallenberg, was discovered to affect cattle and sheep. Many people who worked closely with the infected animals were worried that they were at risk of getting ill. Some countries in Europe were able to test blood samples from people working with these animals to see if the infection posed a risk to people. While it was concluded very unlikely that Schmallenberg virus posed a threat to humans, this work demonstrated the value of being able to check human blood samples to see if there was any evidence of exposure to emerging animal infections. This, combined with information about illnesses in animal workers, will help uncover whether these infections are in fact potential ‘zoonoses’. To ensure we’re all doing all we can to protect animal workers, we've been working closely with the British Pig Executive, the National Pig Association, the British Egg Industry Council, the National Sheep Association, and the Animal Health and Veterinary Laboratories Agency (AHVLA) to invite people working with pigs, poultry or other animals to take part in a new study. 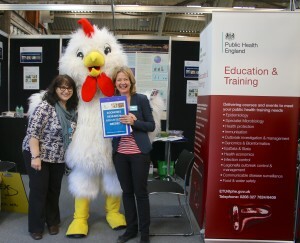 Last week, my colleagues and I from the Gastrointestinal, Emerging and Zoonotic Infection (GEZI) team attended the British Pig and Poultry Fair in Warwickshire to launch this study, the ‘Serum Archive for Emerging Zoonoses’. We’ll also be attending the National Sheep Association Sheep event in July 2014, and we’re working closely with AHVLA to invite their staff members to take part. We’re asking animal workers to donate a small blood sample (10ml) and complete a short questionnaire about the animals they come into contact with. The serum, the part of the blood that contains antibodies, will be extracted from the blood and stored at the Virus Reference Department at Public Health England, Colindale. Should a new infection emerge in animals, we can dip into our archive and test the serum to see if there is any previous evidence of exposure to the infection in humans. The results of these tests will allow Public Health England scientists to understand these new and emerging infections better and to produce public health advice for those in contact with animals. In this way, we’ll be able to take an emerging threat in the present, look to see if animal workers have been exposed to it in the past and develop public health advice for the future. You have not mentioned LYME DISEASE! THIS IS A WORLD EPIDEMIC! Thanks for a great blog that clearly identifies forward thinking and proactive thought. In your blog you have used cited "...we’re working closely with AHVLA to invite their staff members to take part." However, I ma not sure what AHVLA is? With some workers on farms/coming into contact with animals, I wondered if you at visitors to farms too.? Thank you for the really helpful and informative blog. Thanks for your kind words Bren. AHVLA (http://www.defra.gov.uk/ahvla-en/) stands for Animal Health and Veterinary Laboratories Agency, and they are the lead government body covering animal health in the UK. At this stage our research is focussed on workers who come into contact with animals, and not farm visitors, but it’s hoped that the results we receive will allow us to make public health plans for the benefit of anyone that comes into contact with animals.